Whenever a popular website especially user services changes design layout, people start complaining. They either want old interface back or some demand an option to choose between old and new interface. Same is the case with YouTube. 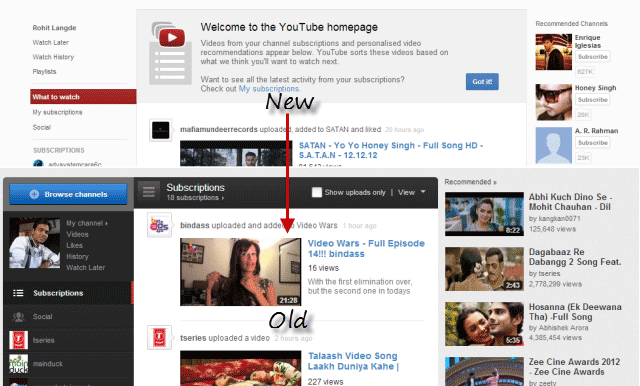 If you hate the new YouTube layout, here’s how to get back old interface. Process is similar to what we did in Chrome. If you decide to get back to normal youtube interface i.e. New one then, it is possible to undo the changes. Simply, delete the cookies of browser and restart. That’s it. People resists and don’t want to change easily and that’s the reason for hate. Same happened with Digg and even Windows 8 but with the time, people get used to it and things settle down. Thanks mate. I’m trying all the possible ways to get back the old interface. This helped me. I was also wishing to turn out new interface into old but didn’t knew. Thanks Rohit.